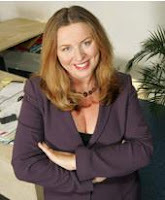 I've just discovered this wonderful entrepreneur from the UK called, Karen Darby. Here's a woman says she felt she knew she wanted to run her own business from around the age of 8. She took on lots of jobs as a youngster, and lied about her age to get a job at a laundromat. She set up her own telemarketing company at the age of 22, and after 7 years had 200 employees and was making 4 million pounds. In the 90's she had two kids and started to work for herself again, training up customer call centers. In 2003 she set up a new business called, 'simplyswitch'. She was thoroughly passionate about the business as it was responsible for helping people get a good deal on switching between services (phone, energy, etc). She loved the business, and finally decided the time to sell the company in 2006 for 22 million pounds (approx $44M). Below is her list of top tips for success, and here's a link to a terrific interview with her - full of much sound advice and wonderful insight on the why behind her decisions. Here's her tip list to succeed as an entrepreneur. And remember most of all - timing is everything.